Reflection involves the incident wave, I, the reflected wave, R, and a normal line, N. The normal is a perpendicular drawn to the barrier. 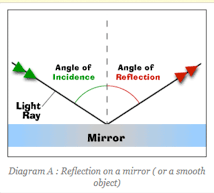 = angle between incident ray and normal; = angle between reflected ray and normal. When looking in a plane mirror, inspect your image. How would you describe your image with respect to left-right orientation, size and distance from the mirror? Watch this video on mirrors. Place the mirror a good distance away from you and walk closer to it. Notice what happens to your image as you approach the mirror. Get as close as you can to the mirror. When you are far away from a concave mirror, your image should be upside-down and smaller than yourself. At some point as you approach the mirror, you will “lose yourself” or the image will become blurry. As you pass this blurry point, your image will become upright and magnified. These mirrors are also called “converging mirrors“. Convex mirrors curve in the opposite direction from a concave mirror. When looking at a convex mirror, the center protrudes outward. With the previous concave mirror example, the “blurry” point is the focal point of the mirror. Images do not form when the object is at the focal point because the rays are parallel to each other, they do not converge or diverage, therefore there is no real or virtual point of intersection. Think of a curved mirror as an arc on the outside of a circle. Now, continue this arc around to complete a full circle. The center of the circle is called the center of curvature. The distance from this point to the mirror is called the radius of curvature, R.
Half of this distance, R, to the mirror is the focal length, f.
Notice that this explains why f is negative for a convex mirror (it is actually inside the curve) and positive for a concave mirror (where f is outside the curve).